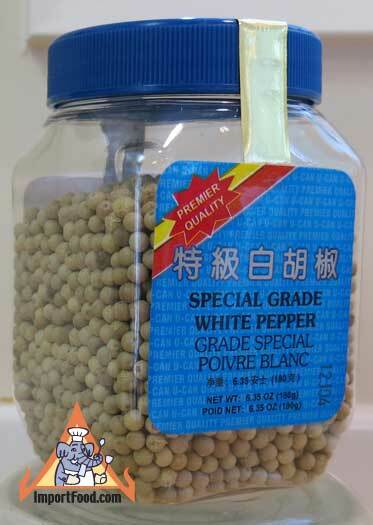 Similar to our whole green peppercorns in brine, these are top quality whole white peppercorns, dry in a jar. Peppercorn plants have small white flowers that bloom in clusters of up 150 florets and hang down a spike. The flowers then ripen into small berries, peppercorns. It takes several years for a young plant to flower and begin to produce. Peppercorn plants prefer a hot, humid, tropical environment such as Thailand, Malaysia or Vietnam. Generous amount, 6.3 oz is a fairly large jar, at a great price. Ingredients: white peppercorn. Product of Malaysia. We also offer green Thai peppercorn.